A long time ago, I worked as a wildfire fighter, mostly in Northern British Columbia. For those of you that have been anywhere north of say, Fort Nelson, you know that it is a barren, desolate wasteland, an endless expanse of black spruce and muskeg. It is flat for as far as the eye can see. I spent a few years hiking around those areas falling trees, spraying water on things, building helipads, and murdering horseflies. Of course, when everything around you is flat and the only landmarks are millions of 7-foot burned sticks that used to be trees, it is very easy to get lost. Miserably lost. Horribly lost. Lost for weeks kind of lost. Luckily, we all had a GPS to rely on, and if all else failed we had a compass. I often wondered what good that would do, however, if I could walk for one million miles in any direction and not find anything. Still, the higher-ups insisted we learned to use a compass, just in case. “PUT THE RED IN THE SHED!” they shouted, staring down at their GPS while I pointed my compass aimlessly north. I also often wondered why they don’t put GPS capabilities in a watch—this was a long time ago, remember, and James Bond was the only one with a watch that told him where to go. Well, Bond’s not the only one. Now I have a Bond watch, too. It’s a Casio Pro Trek WSD-F20, and it is from the future. This watch has everything except the smoke screen (it actually might, but I’m still working through the glut of functions). It has GPS functionality. It has tiny sensors that measure your altitude and the atmospheric pressure, an accelerometer, and a magnetic compass. If you play outside, this watch will help you do it. Those little sensors sense the incoming weather and your exact position on the globe, then sticks it all into a thing wrapped around your wrist, where it shows up on a full-color screen. I, like many people, am not fantastic with technology. My cell phone stays in my truck most of the time. I prefer books over Kindles. I am a bit of a Luddite—my interest wanes quickly when someone explains to me why I should step into the present. But this watch, with all of its bells and whistles, is simple enough even for me. All you have to do is download an app on your phone called Wear OS. That pairs your phone with your watch, which means that if you so choose, you can attach it to your text messaging and Facebook account. Using the touchscreen is simple, and the talk-to-text function actually works surprisingly well. You’re able to download maps offline, which is a huge benefit if you’re going farther afield, and there are a host of apps that help you track what you’re doing and where you’re doing it. Strangely, there doesn’t seem to be one built specifically for the Casio smartwatch that tracks running, but there are plenty of third-party apps that function just fine. I already had Strava on my phone, and it was a one button process to link them. Moment Setter is an app that only works if you have an Android phone, but is made specifically for the WSD-F20. It’s a simple idea: tell Moment Setter when you want to be notified of something, and it will track your activity until you’ve completed it. Want to run to a certain altitude? Want to know when the tide is just right for that wave you surf? Moment Setter will remember that you want to know and tell you when the tide is right or you’ve hit your altitude. 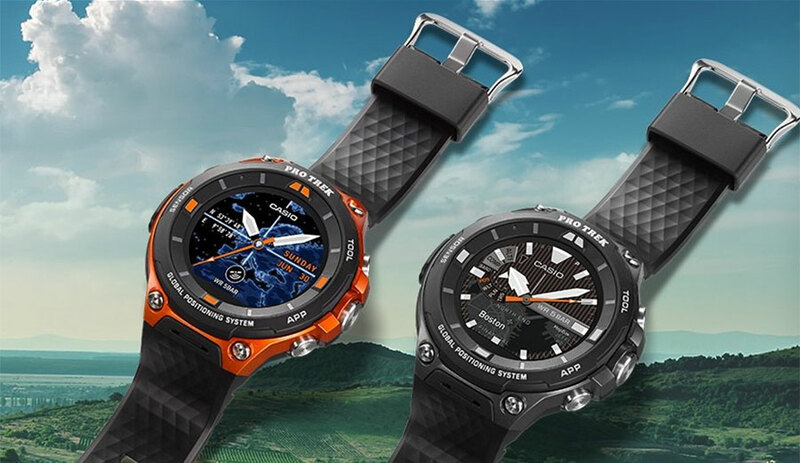 It’s water resistant up to 50 m, looks as though a tank could drive over it, and has a screen big enough to read maps while running a trail or hiking a mountain. Into fishing? Record that hole you found and go back later. Surfing? The Glassy Surf Report app has forecasts for 15,000 spots around the world. Hiking? The watch records information on mountain trails and viewpoints along the way, so when you get helplessly turned around, you can get yourself out. Basically, if you’re doing something outside, there’s an app that will pair with the phone. There are, of course, a few issues, as is the case with anything that has so many features. Although the battery seems to last a reasonably long time (I got two days out of it while running most of the apps and nearly four on regular watch mode), the magnetic charging cable likes to fall out mid-charge. It’s also giant—if you have hands the size of a Christmas ham, you’ll be alright, but if you have average sized hands, this watch is going to look oversized. There’s also no heart-rate monitor, which, for a watch focussed on people who like to push themselves, seems like a bit of a miss. All in all, though, this watch is fantastic. It is ten tools in one. For someone who likes to spend as much time as possible playing in the great outdoors, the Casio WSD-F20 will help you make the most of it.